I know, it seems like I just got back. Hmmm…I guess I did. Anyway, you all know the drill. I will be posting photos and commentary to my Disney twitter account, @Scottwdw, and at Google+. I got plans to post some cool stuff! You all behave while I am gone, ya hear? This entry was posted in Travel and tagged epcot, florida, future world, hot air balloon, orlando, ride, soarin, the land, vacation, walt disney world. Bookmark the permalink. 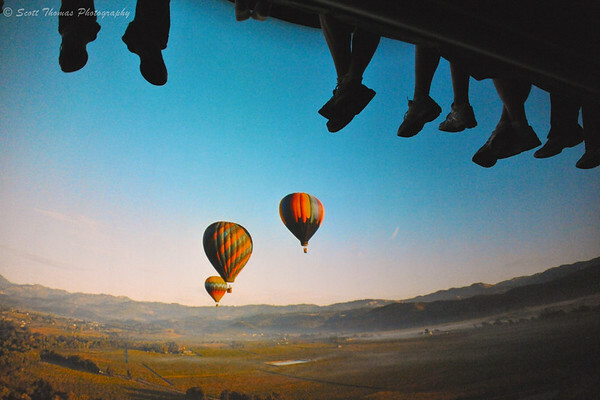 Oh I love Soarin! That was one of my favorites last time I was there – 6 long years ago! Have a wonderful time! What a lovely photo. Intriguing vantage point. Say “hello” to Main Street for me. Cool shots with the balloons in the distance and feet dangling! Have a wonderful time! What a fantastic view ! It is real and yet totally surreal. I love those legs and shoes in the air and the magic of the hot air balloons over the superb landscape. Gorgeous picture !